Periodontal diseases are chronic, ongoing infections of the gums that gradually destroy the support of your natural teeth. Periodontal disease affects one or more of the periodontal tissues: alveolar bone, periodontal ligament, cementum, or gingiva. While there are many diseases which affect the tooth-supporting structures, plaque-induced inflammatory lesions make up the majority of periodontal issues, and are divided into two categories: gingivitis and periodontitis. Gingivitis affects only the gum tissues and can be treated/reversed with a regular cleaning. Signs of gingivitis include red, swollen, bleeding or receeding gums. While gingivitis, the less serious of the diseases, may never progress into periodontitis, it always precedes periodontitis. Once the disease affects the bone & supporting structures of the teeth, the disease is termed periodontitis. When the supporting bone and tissue is destroyed by periodontal disease, your teeth can shift, loosen or fall out. These changes affect your ability to chew & speak and can also affect your smile. Treatment of periodontitis may involve a deep cleaning &/or other more advanced treatment methods such as surgical therapy or laser assisted periodontal therapy. 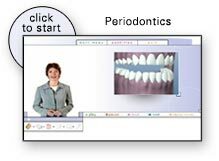 Once the active periodontal treatment is completed; periodontal maintenance therapy is recommended in order to maintain continued periodontal health & stability. Retaining your teeth is directly dependent on proper periodontal care and maintenance. If gingivitis progresses into periodontitis, the supporting gum tissue and bone that holds teeth in place deteriorates. The progressive loss of this bone, can lead to loosening and subsequent loss of teeth. Periodontitis is caused by bacterial plaque that adhere to the tooth’s surface, along with an overly aggressive immune response to these bacteria.